Head to Melbourne Central and Lightning Ridge Opal Minesfor some retail therapy. Relax by the water at St. Kilda Beach and Cowes Beach. Step out of Melbourne with an excursion to The Great Ocean Road in Torquay--about 1h 40 min away. 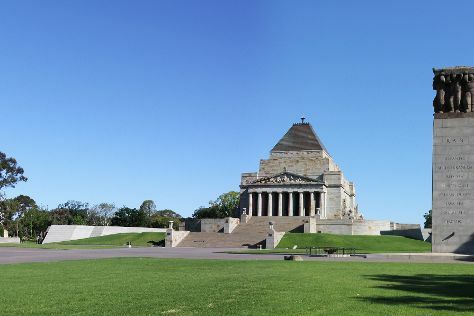 There's lots more to do: learn about all things military at Shrine of Remembrance, admire the natural beauty at Royal Botanic Gardens, stroll through Sandridge Beach, and make a trip to Collins St/Swanston St.
For traveler tips, photos, and more tourist information, refer to the Melbourne trip builder website . Berlin, Germany to Melbourne is an approximately 27-hour flight. You can also do a combination of train and flight. The time zone changes from Central European Time to Australian Eastern Standard Time (Victoria), which is usually a 9 hour difference. Expect a daytime high around 30°C in March, and nighttime lows around 15°C. Wrap up your sightseeing on the 20th (Wed) to allow time to travel to Cairns. Take a break from the city and head to Safaris and Scuba & Snorkeling. Head to Village Gallery and Michael Seebeck Galleryfor some retail therapy. You'll find plenty of places to visit near Cairns: Port Douglas (Wildlife Habitat Port Douglas, Four Mile Beach, & more), Thornton Beach (in Thornton Beach) and Daintree Discovery Centre (in Cow Bay). The adventure continues: identify plant and animal life at Hartley's Crocodile Adventures, soothe aching muscles at some of the top local wellness centers, trek along Esplanade Boardwalk, and enjoy the sand and surf at Wonga Beach. For other places to visit, reviews, ratings, and tourist information, read Cairns online road trip planner . Traveling by flight from Melbourne to Cairns takes 6 hours. Alternatively, you can drive; or take a train. Expect somewhat warmer temperatures when traveling from Melbourne in March; daily highs in Cairns reach 36°C and lows reach 27°C. Finish your sightseeing early on the 30th (Sat) so you can travel back home.